As with every year, the crisp autumn air and the color-changing leaves bring with them the inevitable blanket of cold… which means higher rates of illnesses like pneumonia, especially for those with weakened immune systems. Pneumonia is a lung infection caused by bacteria, a virus or fungi and can make you very sick. It is often spread by coughing or sneezing. Pneumonia frequently occurs as a result of other infections, and people who are age 65 or older are at highest risk for this respiratory infection. Each year, more than 50,000 people are fatally affected by this preventable disease. Here are some preventative steps that you can take to keep you and your loved ones safe. Wash hands regularly with warm soap and water to prevent the spread of viruses and bacteria. Clean surfaces that are touched frequently throughout the day. Cough/sneeze into a handkerchief or use your elbow instead of your hands. Limit contact with cigarette smoke and, if you smoke, quit. Prevent and treat chronic conditions like asthma, diabetes and heart disease. Immunizations are incredibly important and a key piece to preventing illness. Not only does being immunized keep you and your family healthy, but it keeps the community healthy too. Only 61 percent of Americans 65 and older have received their pneumonia vaccinations. 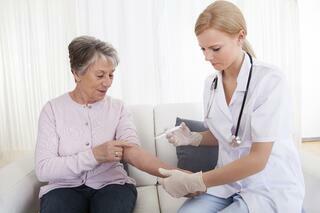 Vaccination is encouraged even for people who had pneumonia at another time in their lives. Since there are more than 90 different germs that can cause the infection, there is no guarantee that having pneumonia in the past protects you from future infection. Here’s the bottom line: Be proactive and ask your provider about getting the pneumonia vaccination. And be sure to do the same for your loved ones. You’ll be glad you did! Aparna Ghosh is a clinical quality consultant at MPRO, focusing on immunizations work in the state of Michigan.